Click the + Button for an overview of the history and the milestones of the the Covenant of Mayors. 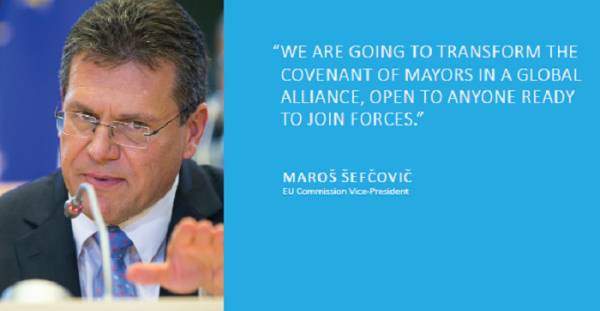 The Covenant of Mayors initiative was launched by the European Commission in 2008, with the objective of engaging and supporting mayors to commit to reaching the EU climate and energy targets. The success of the initiative quickly went beyond expectations and would keep attracting new local and regional authorities in Europe and beyond. 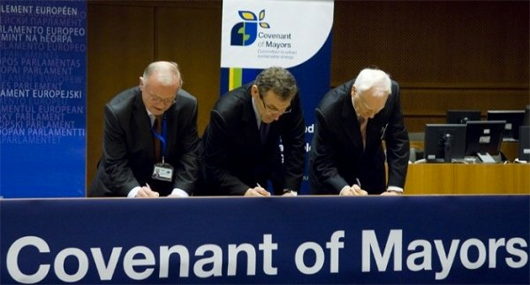 The Covenant of Mayors was already gathering 2,000 cities by October 2010, thus encouraging the European Commission to develop a similar initiative in the EU Eastern Partnership countries. 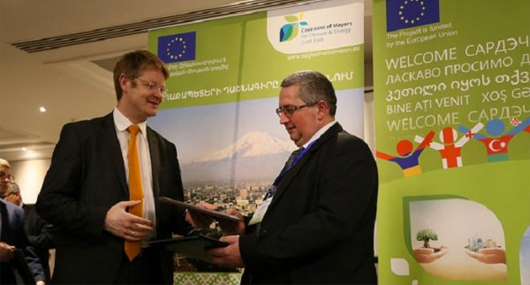 The Covenant of Mayors East initiative kick-started in 2011 and now operates in Belarus, Ukraine, Moldova, Armenia, Georgia, and Azerbaijan. In 2012, the European Commission extended the Covenant of Mayors to the European Neighbourhood South Region by launching the CES-MED project. “Cleaner Energy-Saving Mediterranean Cities"" (CES-MED) supports cities in joining the Covenant of Mayors and committing to ambitious sustainable development policies. The CES-MED Office operates in Algeria, Egypt, Israel, Jordan, Lebanon, Morocco, Palestine and Tunisia. 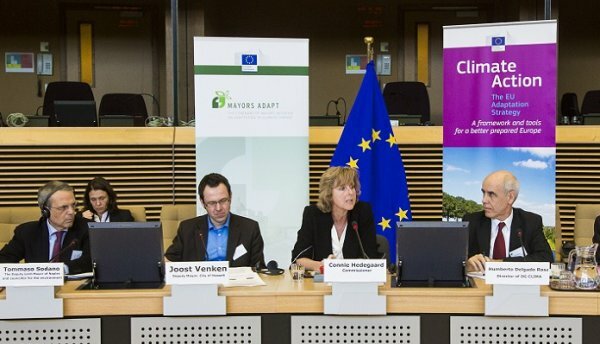 The European Commission launched the Mayors Adapt initiative. Based on the same principles as the Covenant of Mayors, this sister initiative was focusing on adaptation to climate change. Mayors Adapt invited local governments to demonstrate leadership in adaptation, and was supporting them in the development and implementation of local adaptation strategies. 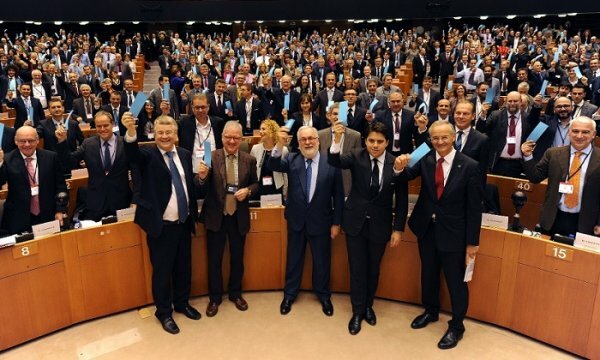 The Covenant of Mayors and Mayors Adapt initiatives officially merged on the occasion of a ceremony held on 15 October 2015 in the European Parliament. The new Covenant of Mayors for Climate & Energy - the goals and direction of which were defined with cities through a consultation process - is both more ambitious and broad-ranging: signatory cities now pledge to actively support the implementation of the EU 40% GHG-reduction target by 2030 and agree to adopt an integrated approach to climate change mitigation and adaptation and to ensure access to secure, sustainable and affordable energy for all. During the Climate Summit in Paris a few weeks later, EU Commission Vice-President Maroš Sefčovič announced the geographical extension of the Covenant of Mayors for Climate and Energy, with new regional offices to be set up in Sub-Saharan Africa, North and South America, Japan, India, China & South-East Asia. In June 2016, the Covenant of Mayors entered a major new phase of its history when choosing to join forces with another city initiative, the Compact of Mayors. The resulting “Global Covenant of Mayors for Climate and Energy” is the largest movement of local governments committed to going beyond their own national climate and energy objectives. Fully in line with the UN Sustainable Development Goals and climate justice principles, the Global Covenant of Mayors will tackle three key issues: climate change mitigation, adaptation to the adverse effects of climate change and universal access to secure, clean and affordable energy. In the meantime, the Covenant of Mayors has continued its global extension with the launch of the Covenant of Mayors Office for Sub-Saharan Africa. Since 2017, regional Covenant offices in North America, Latin America & the Caribbean, China & South-East Asia, India and Japan are being be set up to complement the existing ones.